February is the month of love in the Lowcountry! If you and your special someone are looking for something extra special to do to celebrate Valentine’s Day, look no further. We’ve got some of the best date night spots that are all right around town. Check them out below! Take a romantic stroll around Azalea Park. While the azaleas may not be in full bloom in February, there are still beautiful sculptures, turtle and butterfly ponds and a romantic gazebo that would be the perfect spot for a cozy picnic. Just make sure you pack some warm clothes, a couple of blankets and plenty of hot chocolate and you can spend all evening in this park, enjoying the great outdoors. You can’t go wrong with a romantic dinner at Oscar’s Place. A local favorite for more than 35 years, Oscar’s has the atmosphere and the cuisine to please any palate. Choose from an extensive menu full of traditional southern favorites, fresh seafood and mouthwatering steaks — just make sure to save room for dessert. 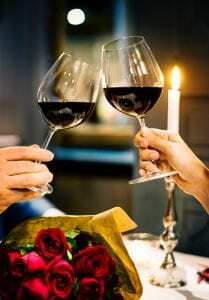 Located in the heart of historic downtown Summerville, the newly reimagined Wine and Tapas Bar offers the idea ambiance for a romantic date night. Explore their expansive wine list and pair with the right food to take your taste buds on a delightful journey you’ll want to keep experiencing over and over again. If the weather outside is frightful, take your activities indoors at the Carolina Ice Palace. Enjoy an evening of skating hand-in-hand and round out your experience with a couple of cups of hot chocolate. There’s nothing quite as romantic as holding on to the one you love as you glide across the ice to the romantic tunes of the season. Plan a tour of the Charleston Tea Plantation located in Wadmalaw Island for a unique experience you and your sweetheart won’t soon forget. You’ll have the opportunity to walk the entire tea production building, stop by the state-of-the-art greenhouse and walk away with your very own tea souvenir, fresh off the plantation. This entry was posted in Foxbank Plantation. Bookmark the permalink.